This blog post was co-authored by Matt Wagner, Program Manager, Microsoft Azure. 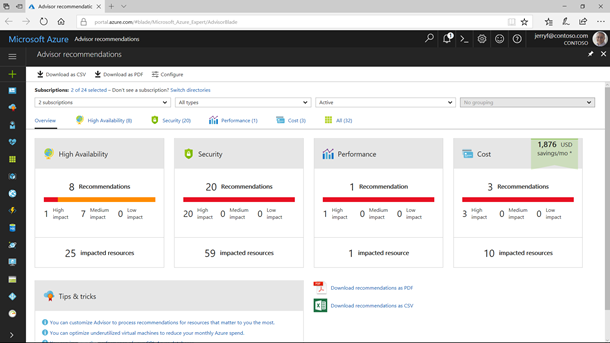 Azure Advisor is your personalized cloud service for Azure best practices that help you to improve availability, enhance protection, optimize performance of your Azure resources, and maximize the return on your IT budget. Azure Advisor was made generally available earlier this year. Since then, tens of thousands of recommendations have been implemented by Azure customers like you. Thank you. Today we are highlighting a number of capabilities that were recently rolled out based on your feedback. These capabilities help you attain a more comprehensive view of your recommendations across all your subscriptions, and the ability to better customize Azure Advisor to the needs of your specific organization. Advisor brings an all-new dashboard to help you more easily review the overall status of your recommendations across multiple subscriptions, in four categories – high availability, security, performance, and cost. You can see the overall status of active recommendations, their impact, and the number of resources that can be optimized. The cost recommendation category also highlights the total possible savings you can achieve if you implement all recommendations in this category. This is a great way to find the extra IT funds you might need to run your next IT project, like making your business-critical resources more resilient and more secure, or building a smart chat bot. In addition, the new downloadable reports in PDF and CSV formats allow you to share Advisor recommendations within your organization to prioritize and collaborate on implementation. Configuration options allow you to tune Advisor to your needs. In the “Resources” section you can, for example, exclude your non-production workloads from displaying any recommendations by simply unchecking non-production resource groups. Many of you would like Advisor to identify your low-use virtual machines, but have different criteria on CPU utilization thresholds for low usage. In the “Rules” section you can customize your desired CPU threshold per each of your subscriptions. Review your Azure Advisor recommendations at no cost in your Azure portal. We won’t stop here, we are working hard on additional Advisor features you will love. We will keep you updated as additional capabilities will be broadly available in coming months. Please continue to share your comments and ideas about Azure Advisor as it will help us continue to evolve this service. Submit your feedback via the Azure Advisor feedback functionality or post your suggestions below.